Here's project #2 for Project Sewn, y'all. This has been a week, I tell ya. Lots of things didn't work out, lots of things did work out, things are crazy, things are subdued, things are exciting, things are boring. You know. Just one of those weeks. So you know, Pink Walrus. Doesn't mean anything, it just popped into my brain and that's what I'm going with this week. This week was all about the pink. This was a fun challenge for me because I'm naturally attracted to pink. I love me some pink. So what did I do? I made more separates! At the end of all of this, I hope you'll be interested to see how my mini Project Sewn wardrobe mixes and matches and even if you're not interested, you'll be getting a dose of it anyway. Yessss..... Anyway, I've a load of things to share with you about this project. Ready to lend an ear? The pink jacket is none other than Named's latest Kaisla Jacket (out of print). Named contacted me before their latest Spring collection aired and asked me if I wanted one of their patterns. I nearly fell off my chair! Did I want a free pattern from their upcoming collection? Me? Hell yes! I then actually did proceed to fall off my chair when I previewed their upcoming patterns. Les sigh. Soooooooo gorgeous. These gals have outdone themselves again! Since I could only pick one, I picked this jacket because I instantly knew it had to be made up. In pink. For Project Sewn. Additionally, I thought it would give the Named gals a little more well deserved publicity. The jacket came together pretty nicely, but I changed a few things for the sake of my own ease in sewing. I ditched the back vent because time and patience. I love back vents on jackets, don't get me wrong, but with a lining....... someone carve out my heart with a spoon. Ugh. And then I completely drafted a new lining for the jacket because I have this way of drafting linings that I really like and that saves me myriad headaches. So if you want to try out this pattern, just know that I didn't try it out all the way. The jacket shell has really good bones. Made only one small fitting adjustment (for my broad upper back) and then boom! It was done! OK, actually it wasn't that simple. Can we chat for just a minute about all things tailoring? I love jacket making. I die for jacket making. The challenge is exciting to me and I mean, who doesn't love a good jacket? But, if you want to make things a crap load ton easier on yourself, do not make a jacket in a bright solid color until you've mastered most of the techniques. Oiy. It's hard. Why? Because every single flaw will show. Printey fabric is like cake compared with solid colors. I also managed to do a double whammy hard thing on this jacket. I picked a bright solid color and a drapey rayon/silk blend (from my shop!) to boot (drapey being the key word there). Can't lie. This thing was pretty difficult, but in the end, I think I finished out on top. Take that you rayon/silk blend fuschia loverly cloth! I pulled out a favorite lining combo from my stash. The body is lined in this lilac acetate/silk hollywood lining and the sleeve in Liberty of London silk charmeuse (did you even know that Liberty comes in silk!!!). I know, you can swoon right now. And then there's the pants. The pants are BurdaStyle #129B. I have a love of BurdaStyle pants patterns because at the behest of other fellow bloggers that I've read, I've found that they are drafted magnificently. And they are. They fit me easily too, meaning not a lot of alterations (only shortened the crotch depth and then I was done). Easy, breezy beautiful. I made these from a stretch cotton sateen (again from my shop). I can see several more pairs too. These are definitely a nice close fitting trouser. They feature a fly front and side slash pockets and that was key for me. These are pretty versatile too. They will be worn and worn a lot. Hop on over to Project Sewn and vote friends!!! And definitely, don't forget to enjoy the other makes. They are most fabulous! I'll be back, later this week, with a tutorial. GASP! I know. It's been so long since I posted a nice tutorial. So long. Too long. So, you're in for a treat. Ta! I love the fuschia with your hair. 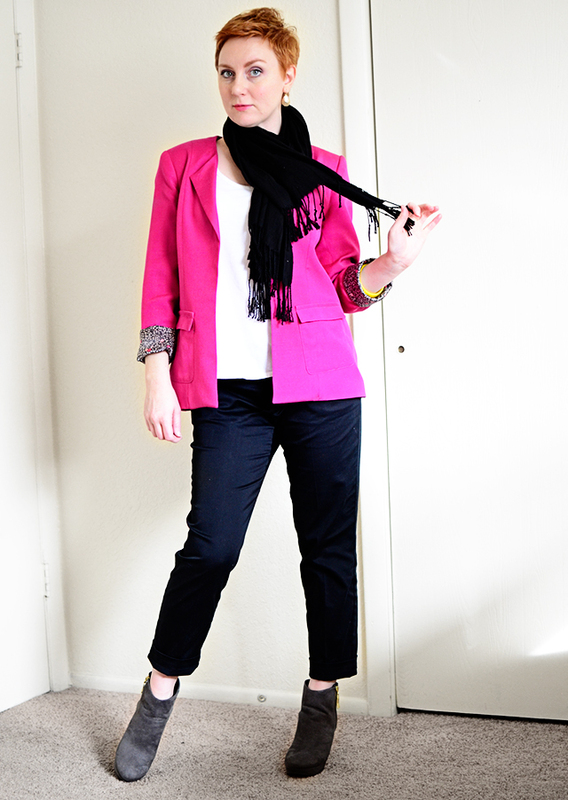 The jacket is well done and the look is just perfect for young professional woman! And did you have to tell me Liberty comes in silk. Great, now that I know, I will be checking out that today and deciding how to fit that in my budget. I hardly ever post comments but I love this jacket - beautiful. Could we see a shot of the inside?? Good luck for the rest of Project Sewn. I absolutely LOVE that all of your projects are going to coordinate with each other. You have a strong grasp on your personal style. I'm really envious, as this is something I wish to master. For as difficult as your jacket was to construct, it looks effortlessly easy and gorgeous here! Great work! This jacket is ADORABLE! Stop making me want blazers, blazers, and more blazers (I'm still dreaming about a perfect plaid blazer after your amazing inspiration a few months ago)! Let me cast my vote for a shot of the inside, too! I want to see more of the lining!! Really fantastic! What a lovely shade of pink, too. Well done, again! Good luck this week. Lady, the amount of style and swagger you have is OUT OF THIS WORLD! Absolutely love this look! I agree with your comment on Burda's drafting. Nothing beats German engineering. I went to the project sewn site through the link and could not find the place to vote. Can you give us the exact link for that please? You and jackets are like me and dresses. I just can't get enough! I'm surprised that you like pink. As a redhead, I steer away from that color. I have to admit though, looking at the hue again your skin tone and hair color - it doesn't look bad at all! Yes, of course! I'll definitely post a follow up about the jacket and the inside! Thank you! I'm very excited about the coordinating as well. Its actually been wonderful so far because everything is going so well with what's already in my closet. A definite bonus. I completely agree. I've never had much luck with the Big 4 pants patterns (let alone the other styles) and this has held true when I've helped fit others in pants. 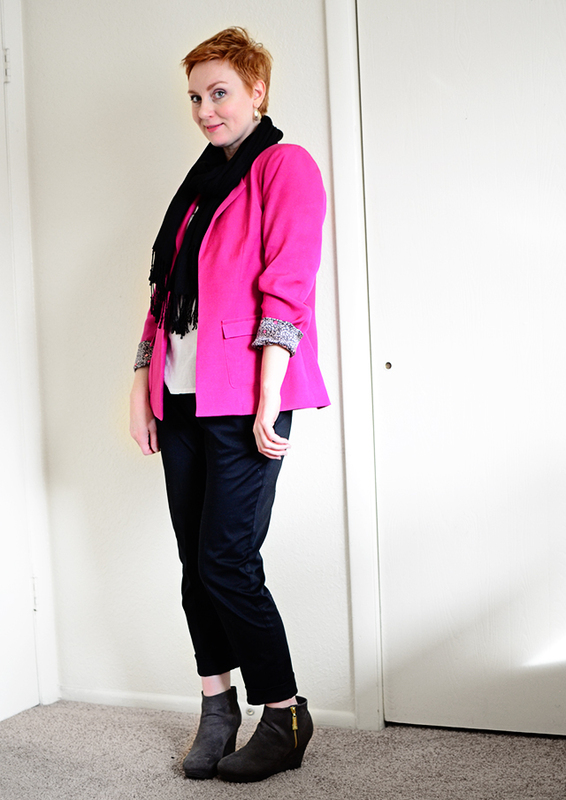 Burda pant patterns always look better and are easier to work with. That crotch curve is simply magical. Oh thank you! Swagger - now that's an awesome word! I like that I have swagger. I know! That goes for just about everything! Ha! i was hoping you would start posting some of your new wardrobe mix and matches, so i definitely look forward to that! love this jacket. love LOVE!! the pink looks amazing on you. 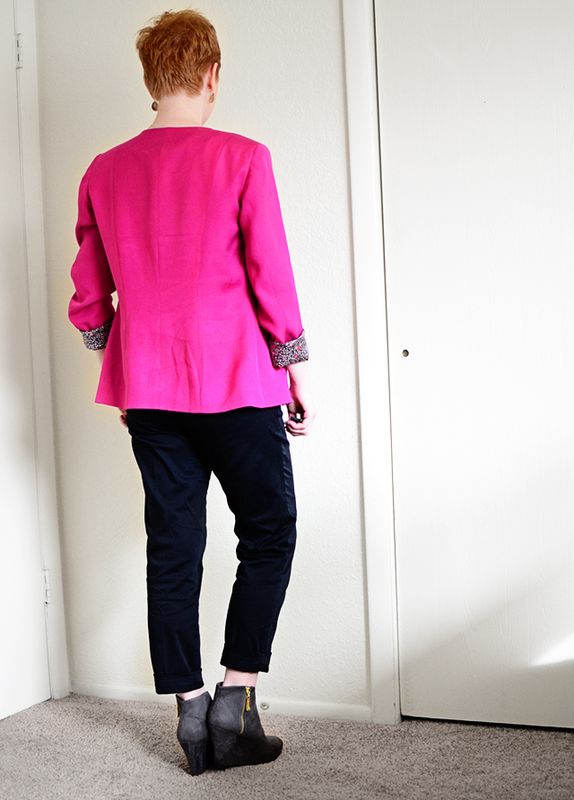 i've been wanting to try a burda pant, so it's nice to hear your glowing recommendation. the whole outfit looks great, good luck this week! As I was growing up, this is something I heard a lot as well. Also red and orange, stay away from those because "you're a redhead." The weird thing is, these are all colors that look really really good on me. Couldn't tell you why exactly but it might be my particular shade of red/orange hair or my particular complexion coupled with the hair, but I get compliments every time I wear colors like this. Without fail. You should definitely try it. I've never taken much stock in anything that anyone says that redheads can't wear. Today's post is a case in point. Oh Sunni, thank goodness for you and your style. Your entry has such CLASS and sophistication. Enough said. Beautiful work! And I love how you incorporated the patter into the sleeves. Nice job! I'm a strawberry blonde but I have a LOT of red in my facial skin tones...so do you. This allows pink to look good on girls like us, regardless of our hair color. Usually green looks better than pink on redheads, but in this case, I absolutely like the pink jacket better than the green in project #1. Oh, and your tailoring is A+++!! You knocked this one out of the park! Wow! What clean lines this blazer has, in a colour that looks terrific on you. When you removed the back vent, it appears that it flares out a bit like a peplum. Can you please explain in more detail how you did this? Thanks. Thanks Tammy! Actually when you remove a back vent, all you're really doing is just following the seamline down the rest of the jacket. It's like a slit, but instead, I chose to sew the slit closed. The jacket doesn't actually flare out like a peplum, I think that's just the way I'm standing. Otherwise, its all the cut of the pattern. The pattern definitely has some shape in the back, more following the lines of your curves. A really great pattern to be sure!